As the International Chocolate Awards 2013 gets underway, I caught up with multi award winning chocolate maker of 2012. Cat Black: Can you tell me a bit about your professional background? Santiago Peralta: I studied law in Portugal, one side of my family are lawyers, but my father had a factory to make furniture. So he taught me a lot about making things, not just the intellectual life. Also, when I was about four we moved to the countryside, where I made my first friends. They had a simple way of seeing things, without a lot of complications. All of these things really helped me later, when the time came to speak to a cocoa farmer I felt at home. CB: It is a different pace in the countryside. SP: There is a different rhythm, you have to wait if you want something to grow. CB: If you began in law, what was the catalyst for you to start working with chocolate? CB: Seeing something done wrong and you wanted to make it right? SP: I was absolutely disappointed when I was studying law and I saw that it had nothing to do with justice. The idea of justice is a big motivation to me. So when I saw these poor farmers, producing maybe the best cacao on earth, being so badly treated and paid, it got to me. Also with my wife I started a company exporting the first organic flowers on earth, a revolutionary concept at the time. CB: Do you still do that? SP: No, but Ecuador has these fantastic roses, six feet tall, made by the volcanic ashes in the countryside. And we grow these fantastic flavour cacao beans. 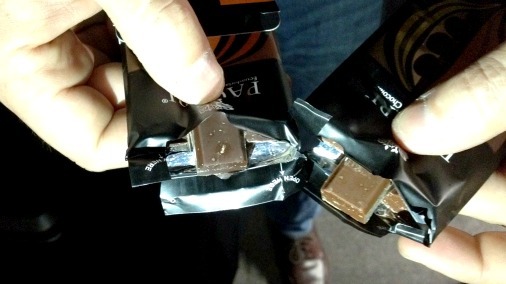 I wanted to taste the chocolate, but when I tasted the chocolate it was already destroyed. It was standardised and boring. So little by little we starting learning about cacao, and we started exporting beans, then nibs, and then some cacao paste, for a few manufacturers. But we saw that we were going nowhere if we continued in the same direction. CB: Because somebody else was going to take it and wreck it? SP: Exactly! Ecuador has been exporting cacao for more than 200 years, but it has no brand of its own. Ecuador has one brand that is known worldwide, that is Chiquita, which are the bananas. That was done maybe in the early sixties. So we don’t have a brand. CB: You have all these amazing resources, but don’t own it. SP: Exactly, Ecuador cacao was owned by whoever was manufacturing with it. It was owned by chocolate makers in Europe or in the States, who all have limitations. So we started doing it, and these last ten years we have built what we now have. CB: So Pacari is ten years old? SP: Yes, I remember one of the first people to help us and promote us was Colin Mace From Booja-Booja. He put our chocolate inside his raw truffles, and also told our story. 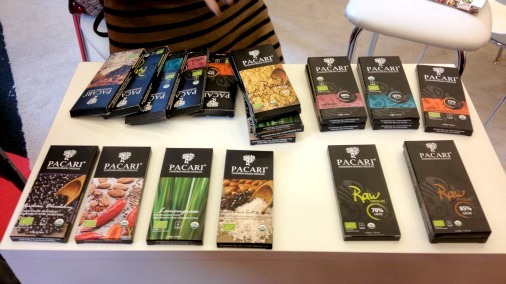 This was the result of three years of friendship and development between Pacari chocolate and Booja-Booja. It was the first time that we were mentioned in a finished product. The flavoured bars are delicious and also award winning! CB: It is very rare for someone to mention what chocolate they use. Someone like Damian Allsop does, much of his work is about the wonderful chocolate that is now being made in the world. But historically most people disguise it. SP: We met Damian about two years ago. Now he is working with us. Paul A Young is also happy to work with us. CB: And Paul won the world gold award for best plain dark truffle with your chocolate! (At The International Chocolate Awards). SP: He won with the 85% Raw. 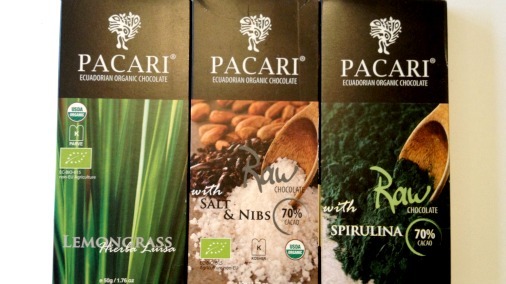 Booja-Booja was the first time that Pacari was in some really good chocolates, and with some ethics. We were going in the right direction. 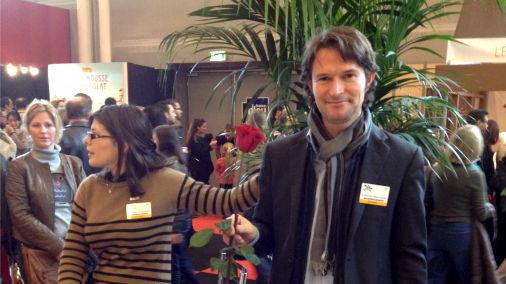 Later on we met Pierre Cluizel, I think at one of the Salon du Chocolats. He was passing by and I jumped and asked if he would he try my chocolate. He said for sure, it was in New York where he is a little bit more anonymous. He was just alone, with a secretary I think. He tried the chocolate and he was astonished. He was like, wow, what’s that!? The first thing he said to his companion; “This is a flavour I recognise; this is what my grandfather gave me when I was a child”. CB: What a lovely thing to hear! SP: I will never forget that. Those are some of the most beautiful words that anyone has given me as a compliment, maybe the best compliment I have ever had. And Pierre Cluizel, someone with so much experience was talking to me! Someone who had only 15 months of doing chocolate, talking to someone who had more than 15 years. He was one of the people who really pushed us, just with one comment. Later on we saw that we had something special. We pushed ourselves, with different origins etc. And each thing we tried taught us something different. We did not go to a school of chocolate, we learnt by trial and error. CB: That is the best way to learn. How have you seen the world of chocolate change in the last ten years? SP: I think that we are influencing it. I see many more people doing things our way, more raw chocolate, becoming more pure. I think we are pioneering. I have seen guys in other countries inspired, people who are growing cacao embracing a few of our ideas. That’s good, I am more than happy. This is going to be little by little affecting the way of seeing chocolate generally. CB: We need more people spreading the word about really great chocolate and what is possible. SP: Now the world of chocolate is expanding as one. You see a lot of different approaches. There is some freshness come into the industry which had been a little bit stuck with the same chocolate for the last fifteen or sixteen years. You hadn’t seen change. Right now there is a revolution. We need people to share these ideas. Santiago shows me the colour contrast in the Piura and Raw bars, both 70%. CB: There are great chocolate websites that taste and review. And what interests me is the people. I am more likely to read a book, if I read an article about an author and think they are intriguing or attractive. So I think we find things through people, we connect with them. SP: My way is relationships, this connection, one by one. What we want to share is the human side of chocolate. It is good chocolate, and we won the awards. But behind that is a story about human beings who are interdependent, which means that when you buy a bar you are not just buying ground cacao beans, you are really helping a lot of people to survive. My work is to be a bridge between whatever the farmers are thinking, and whatever the people eating the chocolate are thinking. So I am bringing the news somehow from one to the other. This communication is key, there can be misunderstanding between what is the product and what is behind the product. CB: Divorced from its origins. I think chocolate is deeply human and personal on every level. It is individuals and trees, and beans and how those are treated. How it is made, in an artisanal way, with the imprint of the people and the makers, all the people along the line. It is the only food that melts at body temperature; it is sweet and full flavoured and wonderful. There is nothing else like it! SP: When you eat a piece of chocolate you are interacting with something that someone made. It is going to put you in a good mood, it is going to feed you, it is going to develop good vibes and good will. We make good chocolate! You are talking to me but I can’t forget the fact that there are all these people behind it. It is not mechanised; the way we harvest the cacao, the fermenting, it is not mechanized. It is very artisanal by nature, the processes are very human. CB: There is quite a lot of pressure on you as a front man. 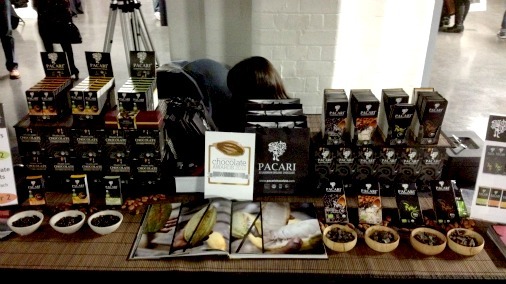 The Pacari stand at Chocolate Unwrapped with awards on display. Are you very foodie yourself? SP: Yes, I have a problem with it! CB: Me too! I grew up around amazing food and can’t forget about it. SP: And this is something that your parents give to you. One of the things my mother gave to me was fantastic cooking! Maricel’s book has a few recipes from my mother (Maricel Presilla’s recently published masterwork, Gran Cocina Latina). CB: What is your desert island chocolate? Can you say? SP: It is very impolite! If I am thinking about an island, I think of Esmeraldas or Manabí, because those origins have a coast. Manabí is one of my favourite chocolates. But to be honest, the one I am really hooked on is the 70% Raw. And right now the 85% Raw. CB: So, to finish, congratulations on the awards (The International Chococolate Awards), you won the world gold award for best dark bar, and also swept the boards. Has there been a reaction? SP: Yes, good and bad reactions. CB: Really? What people trying to stab you in the back? Get rid of him and we would have a chance? SP: Ha ha! To be the winner is fantastic, and we won so many awards. With all my respect to the others we did very well. Before winning, we had reached a standard, but it was not clear. Right now it is clear. Now I can say is that we have interesting chocolate. The reactions have been interesting. Right now someone gave me the email of the president of Ecuador to write him. It is very positive. We have farmers writing to us, very proud because they have seen on TV that we have won. CB: Also writing wanting you to use their beans? SP: That was happening already, we have a line of people waiting. But that depends on sales. CB: That gives you room to expand. SP: Yes. People are very happy in Ecuador, they are writing about us and hosting parties! They want to have a day’s holiday! It was around the 12th October, which is the day Columbus saw America. It would be good to have the 13th October as the day the Europeans, and America, discovered the best chocolate on earth. Ha ha!